World War II veteran and author Donald Hamilton is best known for his 'Matt Helm’ spy series. That long running line ran from 1960 through the 1990s. 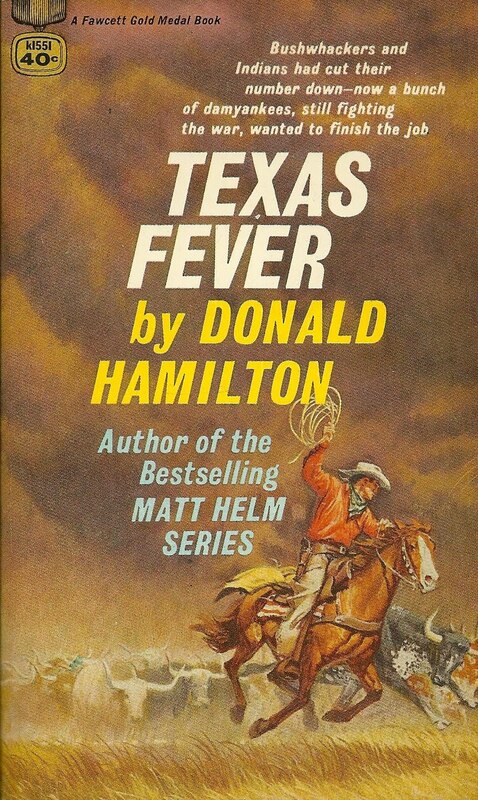 Hamilton also contributed stand-alone crime novels in the 40s and 50s as well as six westerns penned in the mid 50s and early 60s. 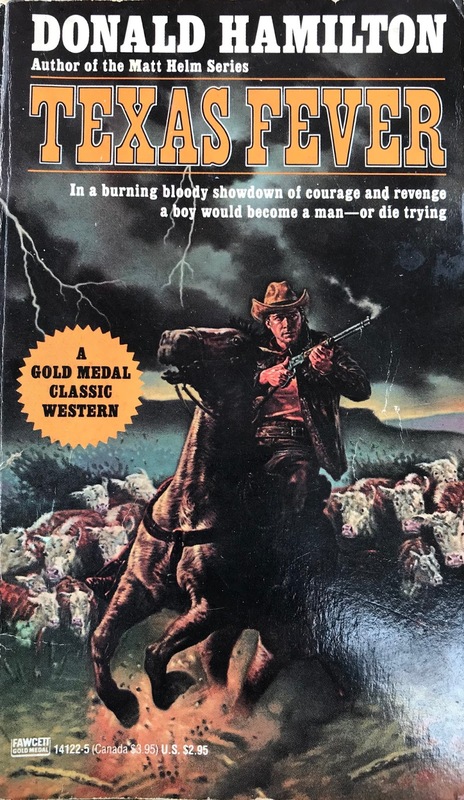 This novel, “Texas Fever”, was released by Fawcett Gold Medal in 1960, and reprinted again by the publisher in 1989 with a slightly modern cover (resembling something more akin to 80s Pinnacle or Zebra). At it's heart, “Texas Fever” is a coming-of-age tale, but it's wrapped in a dusty, rugged range war that emphasizes the “classic western” brand. Young Chuck McAuliffe is on a cattle-drive from Texas through Kansas. His father, Jesse is a Confederate veteran, as is his brother David. The family have been pushed hard, with their ranch nearing foreclosure. This drive hopes to net them $20 a head on a herd nearing 1,200. My guess on the time period is right around the late 1860s, a time when Texas and their steer were still considered scruff and repellent. Complicating matters is a cow disease that warrants the law and buyers to envelope the mid-west in a quarantine. After being forced west at numerous junctions, Jesse, back to the wall, stampedes the quarantine and is killed. 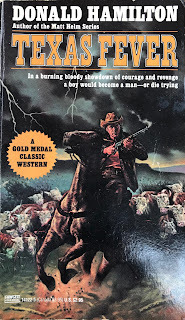 The heart of the story is a cow theft operation that forces weary, tired and broke cattlemen to sell their stock at pennies on a dollar. Chuck sees through the scam, and takes his battle to the crooked preacher, deputy and outlaw. As Chuck is forced to mature and harden fast, he meets up with a con-woman who takes his virginity before trying to go clean in an alliance with him. Soon things get out of hand, and the barrels heat up. Hamilton tells the tale well, pausing for backstory, to propel the narrative. The opening third is fisticuff action, all in the classic western mold – cattle thieves, cap and ball fire and well-defined “good guys”. The middle is bogged down with the convoluted alliances, a confused sheriff and the overall love-dove dialogue. The closing third returns to the prairie, with enough hard-charging mounts and gunfire to fully redeem itself. A quality, enjoyable read from a rare Hamilton western.